HALBAN On Saturday afternoon GUtech opened its doors to the community. 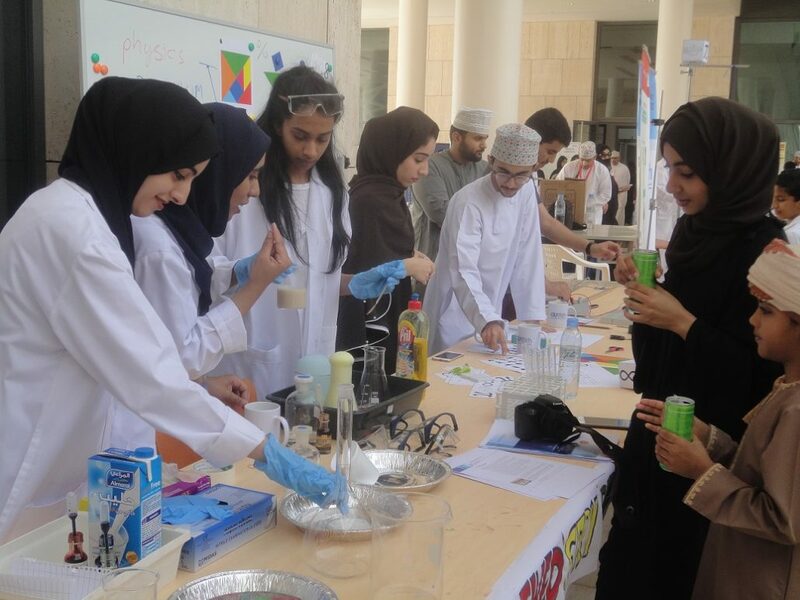 GUtech staff members and students showcased the university’s Bachelor programmes as well as sports, theatre and fun activities for the whole family. One of the GUtech lecture halls accommodated the Computer Science department and their smart solutions. Ali Al Humairi is a Lecturer for embedded systems or so-called smart solutions at the Department of Computer Sciences. Dr. Najah Al Mhanna, Head of Engineering Department and Ali Al Humairi are currently supervising 36 innovative smart student projects in Engineering and 8 projects in Computer Science within a course on smart solutions or sensor embedded projects. During the Open Day Mr Ali demonstrated to interested students and parents that it is easy to drive a small car with the help of a smart mobile application. Once the car passed an obstacle they had to answer a question related to Computer Sciences. A radar sensor installed on top of the car controlled the driving and a Bluetooth system communicated with the mobile phone. Another innovative smart application on display was an automatic system to water plants while being away from home. “The sensor acts like a human arm. It detects the humidity of the soil,” said Ali. The so-called Arduino sensor sends the information to a water pump that starts watering until the humidity level is achieved. A small battery is running the system. This smart water application could be applied for monitoring the water usage in public gardens. Moreover, a temperature and light sensor were presented. Nawal Al Amri and her friend Sumaiya Al Harthy are studying Process Engineering in the 4th year. Last year they participated in the annual laboratory course, conducted at GUtech’s German partner-university in Germany, RWTH Aachen University. They were impressed of the numerous laboratories such as the ultrasound laboratory. Currently they are working on their Bachelor thesis, an innovative project of a desalination plant with integrated solar panels instead of a generator, therefore saving a lot of energy. In their free-time both students are part of a community awareness programme, promoting engineering among school children. They both think that there is an increased positive perception and appreciation of female engineers, a field that has been dominated by males worldwide. However, compared to male engineers, for some females it remains a challenge to find jobs after their studies. In future, Nawal would like to work in the academia and Sumaiya as an aircraft engineer. In addition, to Sciences and Engineering, GUtech also offers Business programmes like International Business and Service Management (IBSM) and Logistics. Both programmes offer ample job opportunities in the rapidly growing service sector in the Gulf region. Fatima Al Salmi is studying in the 1st year BSc Logistics: “I liked Mathematics at school and that’s why I decided to study logistics. I think it is an important field and the future of Oman,” she said. To gain some practical experiences and to combine theory and practice, all students have to conduct internships during their studies. GUtech offers BEng programmes in Process Engineering, Mechanical Engineering, Environmental Engineering and BSc programmes in Logistics, International Business and Service Management, Computer Sciences, Applied Geosciences, Urban Planning and Architectural Design. The language of tuition at GUtech is English.